Patient retention is critical for the success of clinical drug development. Effectively empower patients to remain engaged, educated, and compliant. From taking medication to survey completion reminders, Mosio keeps participants on track. Spend less time collecting data and more time utilizing it. Whether you’re looking to meet study recruitment deadlines, increase patient engagement, collect valuable research data, ensure patients show up for their appointments, or deploy patient satisfaction surveys during your studies, Mosio has a suite of configurable modules that can help you meet your protocol goals. From NIH-funded studies to pharmaceutical research, Mosio’s solutions offer study teams the ability to communicate more efficiently on mobile’s most popular channel: text messaging. We specialize in more than patient engagement. Looking for a way to increase audience engagement at your next healthcare conference or company meeting? 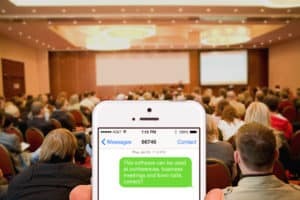 Mosio offers text messaging services for healthcare events and corporate town halls.